The 18th Century estate is a breathtaking climax to a beautiful and historic country drive from any direction. 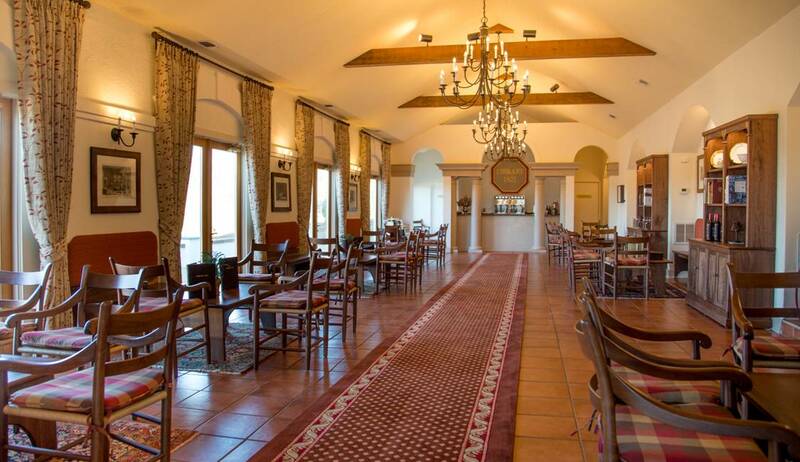 The winery's Tuscan Tasting Room, our hospitality center, is open every day of the year except Thanksgiving, Christmas Day, and New Year's Day. The entire estate is open for tasting our wines in a stroll or in a picnic, and our informed and enthusiastic hosts conduct tastings continuously in the Tuscan Tasting Room, every day of the week, and in Library 1821 on Friday through Monday. The Tasting Room is where the broadest range of our current vintages is introduced, while the Library 1821 presents a changing selection of flights of older vintages from our cellars, and with bite-sized culinary pairings designed by our chefs. Every encouragement is given, also, to enjoying our wines in the truly splendid lawns surrounding the historic Landmark Ruins of Thomas Jefferson's mansion for Governor James Barbour, a pleasant stroll away. There is a fee of $10.00 for tastings of seventeen of our current vintages. For $3.00 more, you can keep your brilliant Weißwein Vin Blanc Crystal Glass, hand chosen by our wine maker, Luca Paschina. 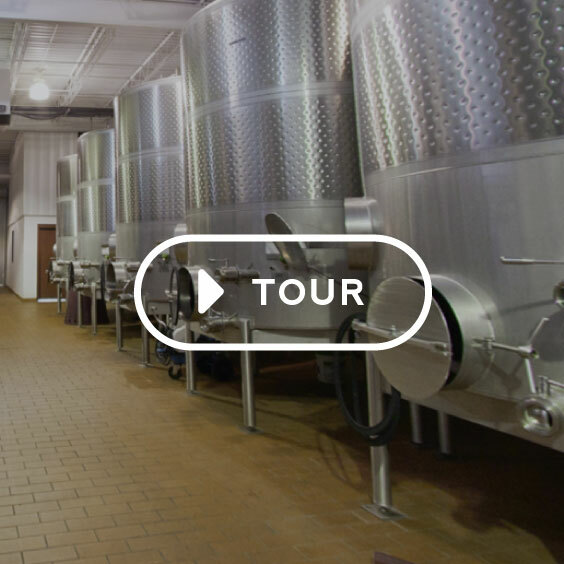 Guided tours of the winery are offered, on Saturday and Sunday, and first-time visitors are especially encouraged to allow the extra time for this introduction to our estate history and winemaking processes. 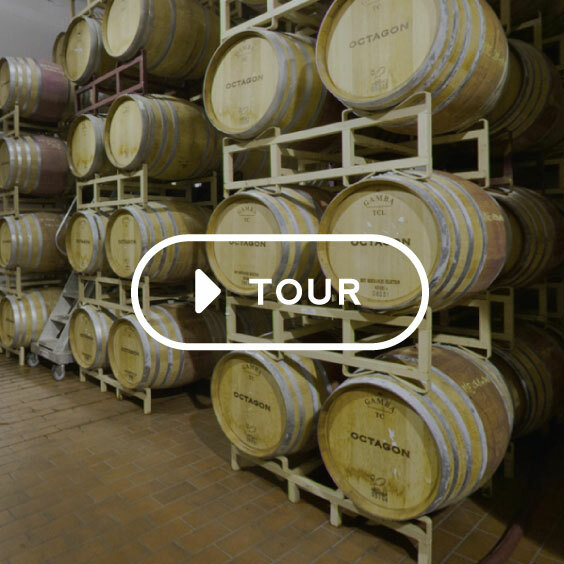 The Octagon Barrel Room presents a permanent exhibition of the biography of our signature wine, and the brief film about the estate is shown throughout the day. 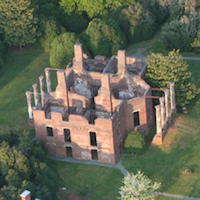 Guests may guide themselves on a tour of the Landmark Ruins, one of Jefferson's true architectural masterpieces. In its elegant Palladian proportions and siting on a gentle knoll, the house unmistakably recalls Jefferson's own, and deeply refreshes our appreciation of structural balance in wine. We warmly recommend a visit. The Library's Tasting List changes periodically, to afford a diversified exposure to our varietal range in white wines and in reds, while always including Octagon, Paxxito and older distinguished vintages of more limited supply, also available for purchase by the bottle. The Library is open Friday 12pm-7pm, Saturday, Sunday, and Monday 11am-5pm. Library 1821 is a repository for selected documents from our history, such as the letter by President John Quincy Adams appointing James Barbour to his cabinet as Secretary of War, original household china donated by descendants of the Barbour family, and commendations for our wines. House-baked breads, house-cured charcuterie and fine local cheeses are worthwhile optional accompaniments to tastings at Library 1821. A four course feast paired with Barboursville wines, prepared by Chef Spencer Crawford. Brut and canapés in the Octagon Cellar and a four course feast paired with Barboursville wines in the Piedmont Arcades, prepared by Spencer Crawford in cooperation with wild mushroom expert Dr. Jeff Long. Enjoy a four course feast paired with Barboursville wines prepared by Chef Spencer Crawford. $80 per person exclusive of wine, tax and service. Guest Chef Tae Strain of Momofuku, D.C.
Add to Calendar 2019-07-14 17:00:00 2019-07-14 17:00:00 15 Guest Chef Tae Strain of Momofuku, D.C. Celebrate with us and enjoy a five course lunch inspired by retrospective dishes and extravagant wine pairings including rare vintages from the late 90's. Prepared by Chef Spencer Crawford. Seating is limited. $225 per person, all inclusive. Reservation required. 540-832-7848. Welcome to this rare opportunity to taste 20 valuable older vintages, along with a sampling of 2018 Octagon from barrel. Award artisanal cheeses, charcuterie and fresh breads from our Palladio Restaurant will refresh the palate. $45 per person, no reservation required. Brut and canapés in the Octagon Cellar followed by a four course truffle dinner paired with five Barboursville wines in the Piedmont Arcades, prepared by Chef Spencer Crawford in cooperation with truffle forager Dr. Jeff Long and his truffle dog Este. Enjoy a four course truffle feast paired with five Barboursville wines, prepared by Chef Spencer Crawford. If we cannot meet your needs on site, we recommend these nearby accommodations. 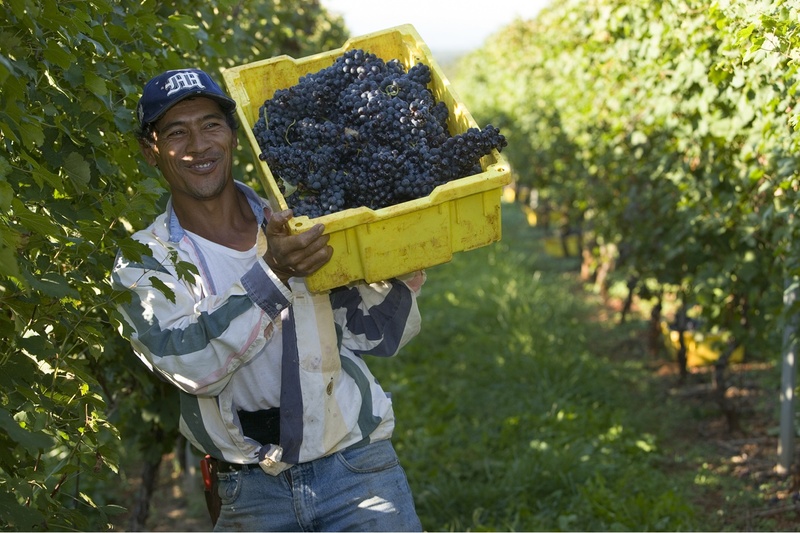 To request a reservation at The 1804 Inn or Vineyard Cottage, please call us at (540) 832-5384. Visit the 1804 Inn page for more information.